So, you’ve been invited to a 1st birthday party and now you need a worthy first birthday gift. When picking out gifts for one-year-olds you want to find things that’ll spark their interest and encourage these skills. Whether you want a fun toy, an educational gift or keepsake you’ll find something here. 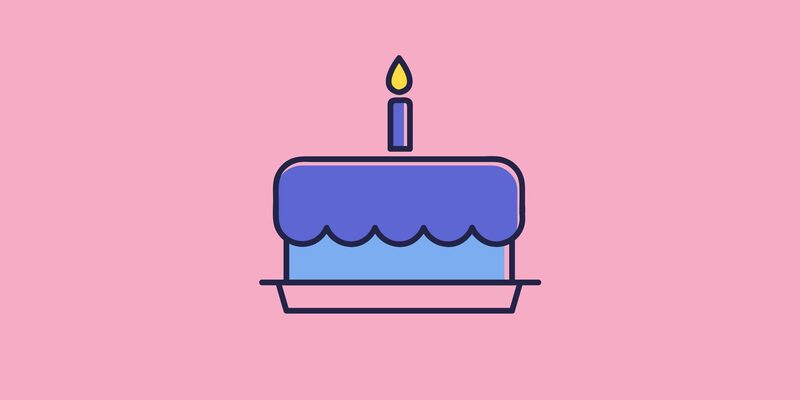 Here are some great first birthday gift ideas for the little one turning 1! This personalized mountain bear natural growth chart makes the perfect adornment to your child’s room or nursery. No more wall marks needed for recording their growth. This treasured wooden keepsake will last for years. 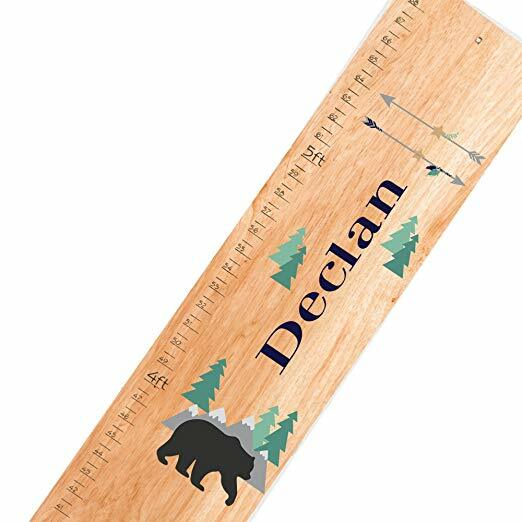 The craftsmen personalize your child’s growth chart with a beautiful imprinted design. Comes in a few different designs for boys and girls. 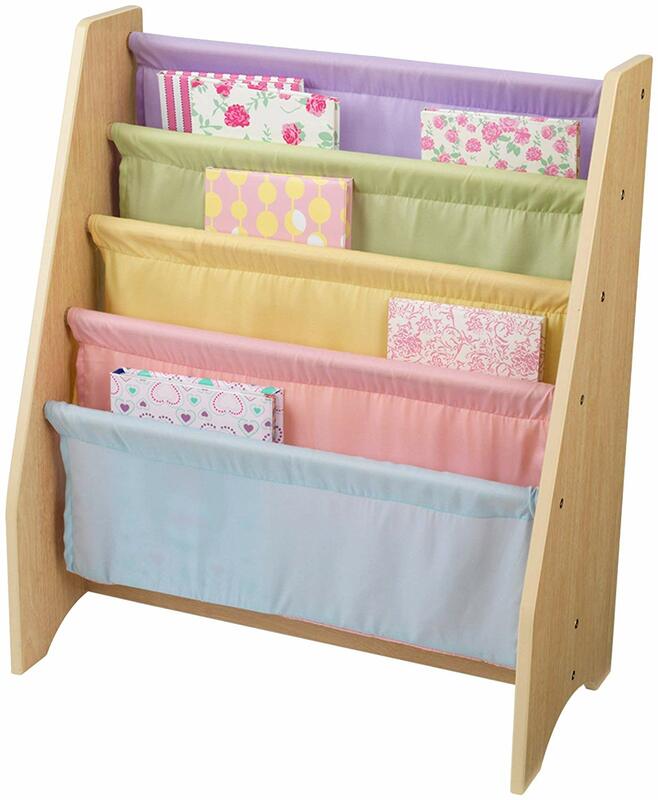 Simple and sturdy, the KidKraft Sling Bookshelf is a great way for your little ones to organize their books. The soft canvas shelves protect hardcover books, board books and coloring books so they are not all over your living room floor. The sturdy wooden frame means this shelf will stand up to enthusiastic readers for years to come. Rocking activity strengthens the core muscles and arms during the motion, this activity is also helpful for improving balance. Climbing up and down the rocking horse also strengthens the arm and leg muscles. Kids got years of use from a rocking horse and it certainly benefited their little sensory system! Rockers can help kids improve their mobility, inspire independent & group play, and gain confidence from social communication with others. It is also a good method to put babies outdoor and distract from screens. 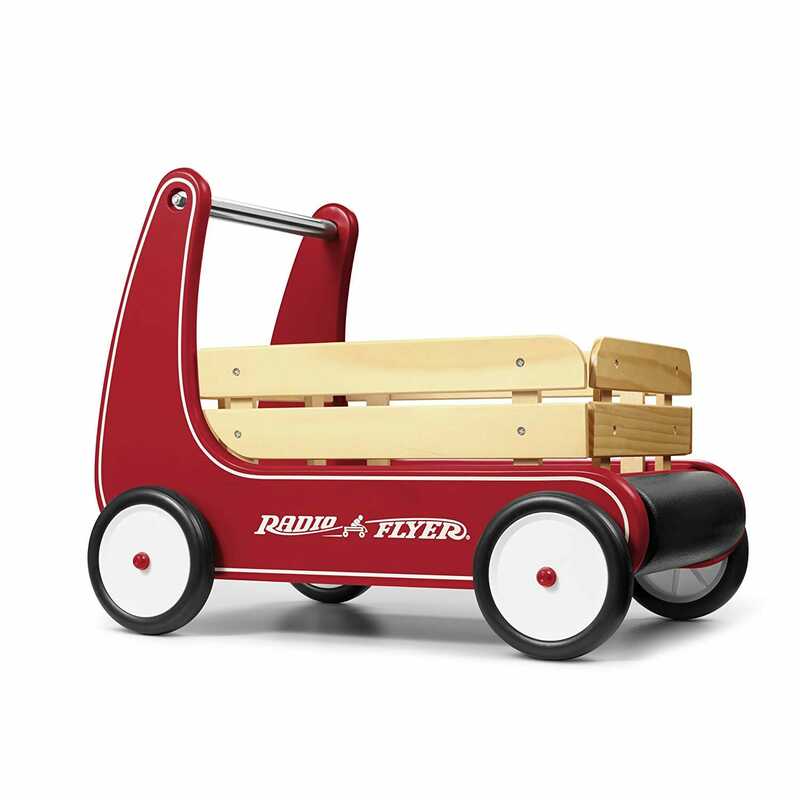 Classic, safe and versatile, this award-winning push wagon is a favorite for children and parents alike. The “resist push” feature allows beginner walkers to safely build confidence and balance. Removable wooden stake sides add to the fun and the furniture friendly bumper protects your home as your little one learns to walk. The product features durable molded wheels with grip tread for comfort and travel. Perfect for a 1 year old. 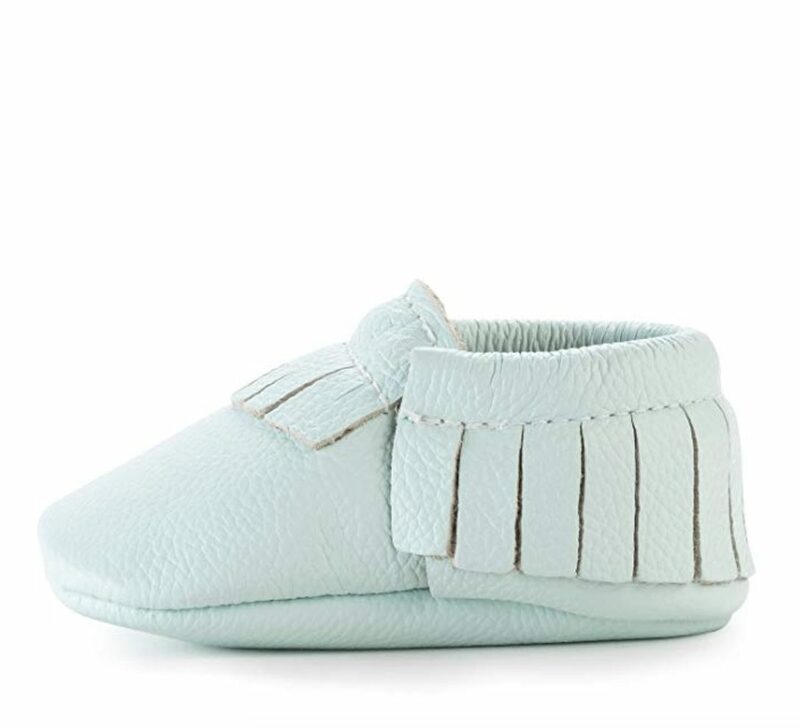 BirdRock Baby moccasins are constructed with durable genuine leather, promote proper foot development in young walkers, and stay on your little one’s feet! Better yet, with every purchase, BirdRock Baby donates to Feed My Starving Children to provide food for an entire day to a child in need. They come in many colors for your baby girl or baby boy. 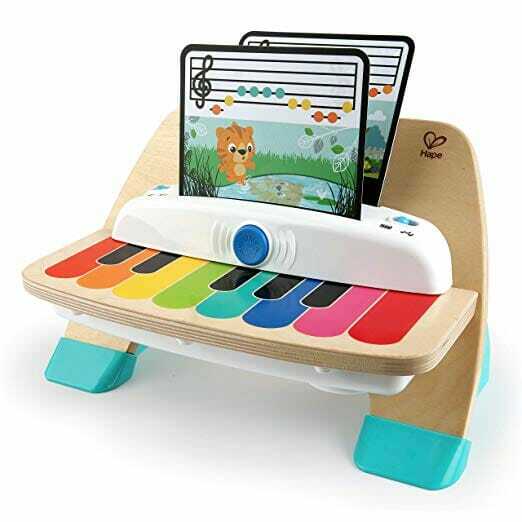 With the delicate touch of her little fingers, Baby Einstein and Hape’s Magic Touch Piano will let baby create thousands of different songs. Made from wood, this piano toy features magic touch technology – no buttons or keys needed! Two modes of play give your toddler the ability to make her own music or play along with classic melodies. Giving your baby toys that make music helps her tune into different rhythmic patterns and sounds at a young age. This animated Peek-A-Boo Elmo is sure to delight as he recites 13 different phrases while hiding behind a satin-accented blanket before popping back out with his signature giggle. Soft red plush and accurate Elmo details, as well as a red signature on the blanket, are sure to please Sesame Street fans of all ages. As always, high-quality and huggable plush ensures that GUND products remain loyal pals for years to come. Surface-washable. 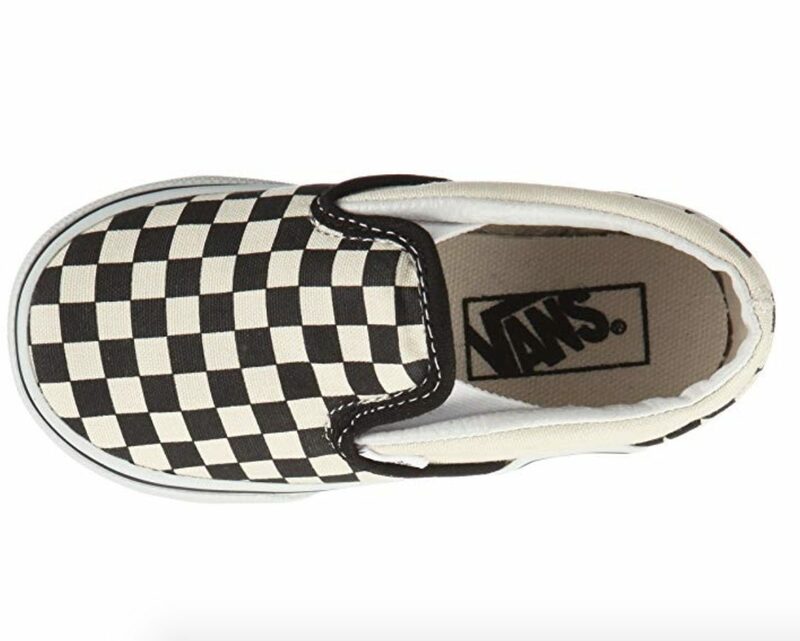 The Mix Checker Classic Slip-On features sturdy low profile slip-on canvas uppers with the iconic Vans checkerboard print, padded collars, elastic side accents, and signature rubber waffle outsoles. Perfect gift for the mom who is really into fashion. 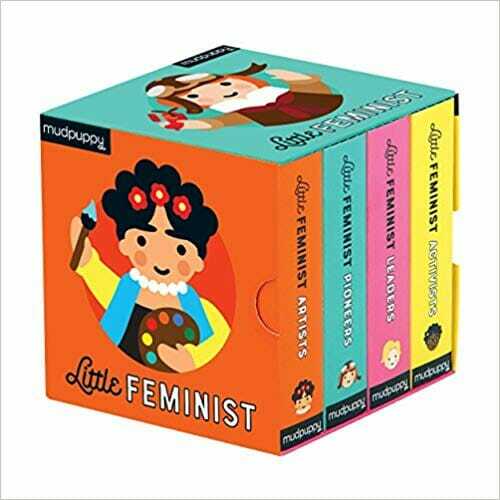 Mudpuppy’s Little Feminist Board Book Set is comprised of colorful illustrated portraits of real women who have made historical impact on the world. Illustrations by Lydia Ortiz and words by Emily Kleinman introduce children to these important people in history with images that are fun for youngsters and also realistic. Ideal for your little one’s bedroom or playroom, this chair comes fully assembled. With its soft edging and curved designed the “Personalized chair” is safe and practical for children. It has a strong wood frame that will add durability, it is padded using high-density foam for added comfort and upholstered with Checkers Polyester fabric. Weekly vacuuming is recommended for all fabric components to reduce soil buildup. Use light dishwashing soap and warm water for more difficult areas. Emerging toddlers will have plenty of fun with this activity center, by moving around shapes and figures on wood blocks in their guided tracks and slots. The Tree Top Adventure will offer a unique and satisfying experience for your young one. With so many activities built into one toy, this is perfect for hours and hours of play and helps build motor skills. 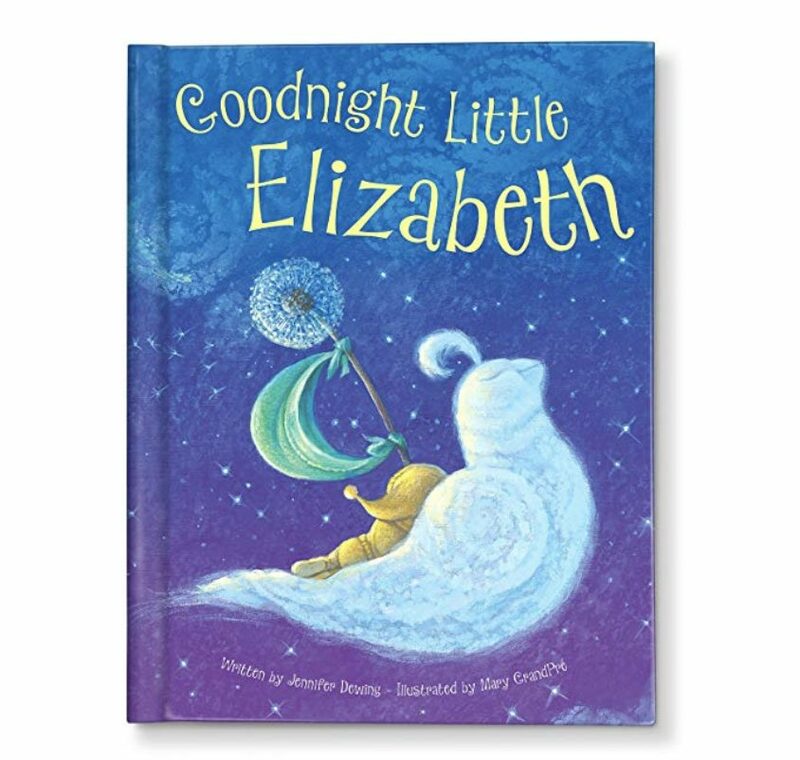 Engage and soothe young children before bedtime with the personalized story “Goodnight Little Me” that incorporates their name on the cover, in the story, and even in the illustrations. In this lyrical lullaby, a Goodnight Parade marches through your child’s sweet dreams: sheep come a-leaping, dogs dance in a kick line, crickets chirp, and owls hoot-hoot. Wishbone Flip is a brilliantly simple ride on toy for children aged 12 months to 5 years. Its innovative flipping mechanism transforms Wishbone Flip from rocker to roller in seconds. Tuck your teddy inside and its a toy stroller too! A great baby gift for your toddler! Also available in white. Or check out Wishbone Mini-Flip in 8 gorgeous colors for 9 months and up! Baby is here! Make this exciting time even more special with a Time Capsule! Preserve precious mementos in this sturdy keepsake container and store it away in a safe place to look back on years later. 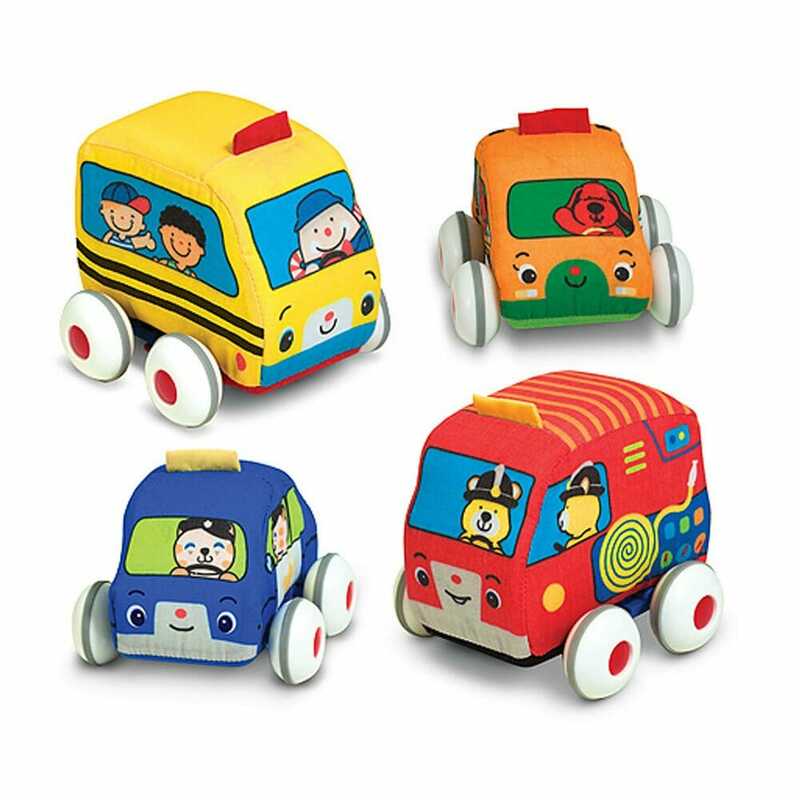 These soft, lightweight vehicles mimic one of the best of a young child’s everyday world: a school bus, family car, fire truck, and police car. The rev up mechanism inside each makes it easy for babies and toddlers to get big acceleration with little input: They just pull them back and release to see them zoom off across the floor. Featuring bright colors, these vehicles nurture early vision, focus, and color awareness. This sleepy time play doll set features a Wee Baby Stella doll with a soothing lavender scent, a teddy bear, magnetic bottle and a night time story book. With ultra-soft fabric and embroidered facial features, Wee Baby Stella is meant to be cuddled, snuggled and held tightly. A great gift 1st birthday gift for 1 year old girl. Children can learn to solve the problem by themselves. This shape sorter bus with wooden blocks encourages sensory skills, fine motor skills, hand-eye coordination and more. 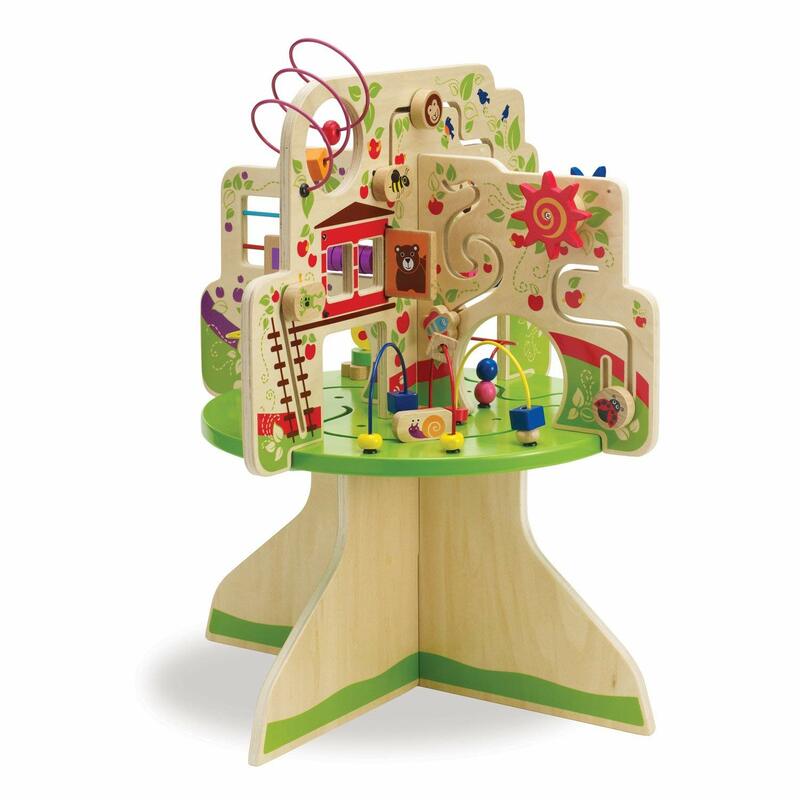 The beautifully crafted toy features smooth, natural wood, a slide-off lid, and 13 cut-out shapes in four of the sides. The 13 brightly colored solid wood shapes are easy for little hands to grasp and make a wonderful ‘clunk’ as they drop in the shape sorting cube. Plus the bus itself is a pull toy!